Dear Florida Lawmaker – Are we really stuck in Prohibition? Seriously “only in FLORIDA” ? If you’ve followed the craft brewing crescendo of late, you know that Craft Beer is exploding in almost every state of the union – including Alaska and Hawaii! Craft Beer is an affluent “sport” where a pint of the finest brew starts at $5. and a Nielsen study quotes that close to 60% of craft beer drinkers earn over $75K a year. It’s an exploding industry stateside and internationally – and we, Florida craft beer consumers (we’re all of voting age!) are fortunate. Within an hours drive of almost anywhere in the state is a local craft brewer ready and willing to serve us brews that satisfy even the most finicky palate! BUT, on the brewery side, it’s certainly not a fast road to riches – consider the start-up costs (upwards of $400K according to posts on ProBrewer.com), licensing, and, if you have your way, a stranglehold of regulations. For brewers, it’s a labor of passion and love, and fortunately it’s becoming a community of good people with good intentions and the American dream of hard work leading to good profits – EXCEPT WHEN IT COMES TO YOU, OUR FLORIDA LAWMAKERS. Despite the potential tax revenues, tourism dollars, jobs, and general well-being that comes from the beer industry, of which craft brewing is a part, you’ve been crafting backroom legislation intended to stifle the growth of the craft brewing industry and working to increase regulations to benefit the big beer distributors who line some of your pockets with campaign contributions. Lewis Bear (an Anheuser Busch distributor) is a great long-term friend of our Senate President, who is quoted as saying he will support anything that Lewis Bear puts before him. Florida could be a craft beer tourist destination bringing millions (if not billions!) of tax and tourist revenue to our state! FL Legislation Pending to KILL Craft Brewing… What can “WE” do? You may or may not be privy to the maelstrom brewing around craft brewing in our great state of Florida – and if you don’t you’re in good company! The big beer distributors (especially those “featuring” Belgian owned Anheuser-Busch InBev) pour millions of dollars into Florida’s campaign funds to support the current self-professed “pro-business” (bahahaha!!! NOT!) 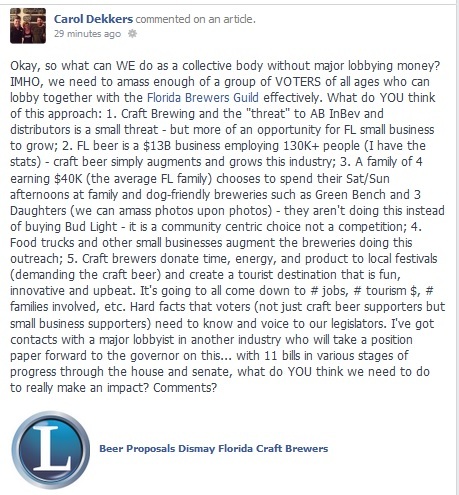 legislators -dollars intended to PROTECT BIG BUSINESS and kill craft beer in Florida. All told, there are almost a dozen house and senate bills making their way through the various committees and structures – intending to make sure that the small craft brewer pays the piper (the big beer distributors!) for their own beer that they wish to sell to willing patrons. One such bill just passed its committee last week on a vote of 8-1 and would require breweries to pay a distributor a 30-40% profit on their own beer (that they bottle or can on premise) before they can sell it to their patrons. It doesn’t even have to leave their refrigerators – and the distributor can actually refuse to allow them to even do the sales in the first place! And this is one of only a dozen pieces of legislation that the distributor’s lobbyists are pushing through in Florida – wait until you hear some of the other ludicrous proposals intended to “protect” and preserve the rights of big beer over the underdog craft brewers!!! WHAT CAN WE (YOU AND ME AS FLORIDA VOTERS) DO? What do YOU think? PLEASE give me guidance (and your email address if you’d like to participate in preparing a position paper to present to the Governor) – our future depends on all of us!